For twenty-five years, European left parties have joined broad coalition governments and come out with nothing to show for it. Is it a shortcut, if it’s seemingly the only path on offer? Many left parties in Europe today see participating in a center-left coalition government as the only realistic way to win reforms. They often justify joining these administrations by reasoning that having a left party in government will at least block the most regressive policies and keep a more reactionary formation from taking power. These parties also believe government participation will increase their credibility in the eyes of voters and members, ultimately strengthening their prospects to govern on their own. Twenty-five years of history, however, suggest that these expectations are rarely met. 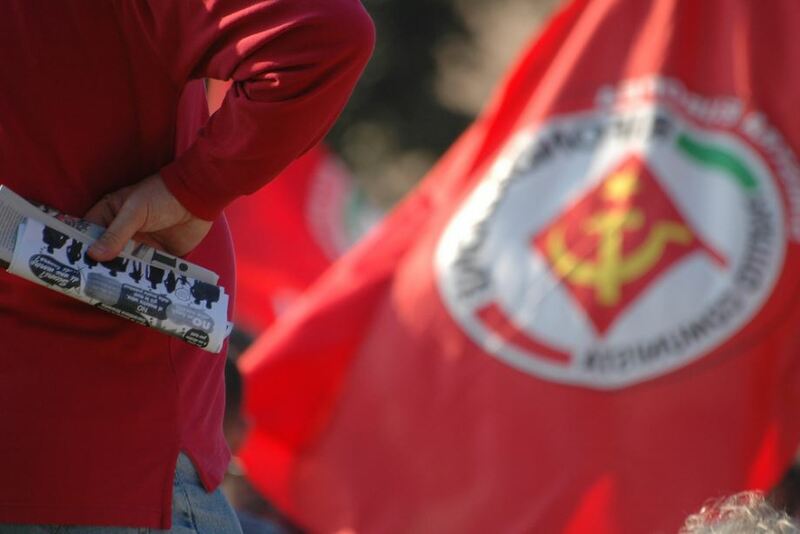 In the early 2000s, Italy’s Rifondazione Comunista became an important touchstone for the European left. Well-grounded in the country’s longstanding communist tradition, self-critical of its own history, internally diverse and pluralistic, open to new ideas, and deeply embedded in the social movements, Rifondazione appeared to many as a role model for other young, radical left formations across the continent. It played a lead role in the 2001 antiglobalization protests in Genoa and made a huge contribution to the antiwar movement that brought three million people onto Rome’s streets on February 15, 2003. From 2006 to 2008, however, Rifondazione surrendered to lesser-evil politics, joining a center-left government coalition to prevent Silvio Berlusconi from returning to power. Once in government, the party was forced not only to defend budget cuts it had hitherto opposed, but also to vote for military interventions in Lebanon and Afghanistan. Rifondazione expelled two senators who continued to vote against the Afghanistan deployment. Government participation turned the “party of the movements” into an organization that often seemed to oppose them — the “party of alternatives” found itself compelled to implement the politics of “no alternative.” Its meager attempts to push through social or progressive reforms went largely unnoticed. The fallout proved catastrophic: only two years later, Berlusconi retook power, and Rifondazione didn’t win a single parliamentary seat — the first time since 1945 Italy’s parliament had no communist force. It has performed successively worse in every election since. Both the party and social movements descended into a political depression of historical proportions. Seeing former allies cross the barricades created an atmosphere of distrust and sectarianism. The subsequent alienation of large parts of Italian society from the political system mostly — if not exclusively — benefited Beppe Grillo’s protest party, the Five Star Movement. Rifondazione’s stint in government discredited it so much that it can no longer relate to widespread voter dissatisfaction. Another once-leading party of the Western European left, the French Communist Party (PCF), faced similar losses after joining government. In the 1997 parliamentary elections, the PCF won 9.9 percent of the vote and joined the Plural Left, a red-red-green coalition led by Socialist Lionel Jospin. This government initially enjoyed a degree of success, managing to enact several important reforms, like the thirty-five-hour work week, and refusing to submit to the Third Way strategy Schröder and Blair were then trumpeting. It could not, however, break with the neoliberal framework. Ultimately, it implemented the most comprehensive privatization program in recent history and agreed to participate in the 1999 NATO war in Serbia. In the 2002 elections, the PCF collapsed, winning only 4.8 percent. Two years later, it found itself reduced even further to 4.3 percent. It recovered slightly thanks its 2012 alliance with Mélenchon’s Left Party, when the party claimed 6.9 percent — better, but still far below its pre-government results. France’s biggest left-wing force discredited itself by participating in a neoliberal government, a circumstance that allowed the National Front (FN) to become the country’s strongest party. Indeed, the FN receives some of its best results in former PCF strongholds. Riding a wave of public outrage in the wake of the financial crisis, the Icelandic Left-Green Movement (VG) won a spectacular 21.7 percent in the 2009 elections and subsequently led the country’s government. Though Iceland structured its bank bailouts differently than other European countries, it kept an overall neoliberal paradigm in place. While the VG had always opposed joining NATO and the European Union, the party eventually directed the government to submit an application for EU membership. In 2013, the party’s result was halved to 10.9 percent. After the Panama Papers reignited a crisis in the political system, the Left-Greens, then in the opposition, managed to recover a measly five points, bringing them to 15.9 percent in the most recent parliamentary elections. The upstart Pirate Party, untarnished by government participation, came in just behind, with 14.5 percent. We see similar trajectories in other Scandinavian left parties: the Norwegian Socialist Left Party (SV) watched its support plummet from 8.8 percent to 4.1 percent during its period in government (2005–2013). The Swedish Left Party (V) faced a similar decline. A decade after its 1998 far-left, EU-critical campaign won 12 percent of the vote, it softened its radical image and joined a red-red-green alliance. In 2014, the party found support from only 5.6 percent of voters. Denmark’s Socialist People’s Party (SF) ran a similar left-wing and EU-critical campaign in 2007, capturing 13 percent. In 2011, it conducted a more moderate campaign in hopes of joining government, and its support fell to 9.2 percent. Its subsequent participation in a center-left coalition lowered its popularity even more. In 2015, it won just 4.2 percent of the vote. The situation has been somewhat less dramatic in Finland. In 1995, the Left Alliance (VAS) joined a “rainbow coalition” government after claiming 11.2 percent. In 2003, the party received only 9.9 percent but rejoined the government in 2011 with 8.1 percent. The party’s decision to leave the coalition before the end of its term probably rescued it from a more dramatic decline: it managed to secure 7.1 percent in 2015. Some might argue that circumstances change when a left party leads the government, instead of serving as a junior partner. But the Greek experience suggests that this is at least not always the case. The troika’s institutional power forced Syriza to implement and even expand neoliberal policies. As a result, the party lost an entire layer of its membership, including many notable personalities. After only six months in government, it had already lost several hundred thousand votes. According to polls, this trend continues. Events in Cyprus are equally uninspiring. In 2008, a Communist won the presidency for the first time in the country’s history. His party, the Progressive Party of Working People (AKEL), enjoyed massive public support, but the government nevertheless buckled under pressure from the European institutions and pushed through draconian austerity measures. The party’s results fell by 10 percent in the next presidential elections. Though outside of Europe, we can observe the same developments in Greenland: in 2009, the democratic-socialist Inuit Ataqatigiit party received a stunning 43.7 percent of the total vote. The party took power but failed to fulfill voters’ expectations. Its support fell to 34.4 percent in 2013, and it left government. This survey demonstrates that no examples of left participation in government have produced a break with neoliberalism over the last twenty-five years. Also the lesser-evil strategy simply did not succeed, even on its own terms. These failures disappointed voters, who had hoped for large-scale reforms, and contributed to the widespread perception that the Left belongs to the establishment. In many countries, this helped feed the growth of right-populist and fascist parties. Why did so many left governments fail? We could claim that party leaders all across Europe are neoliberal wolves in red sheepskins who intentionally betray their parties’ principles once in power. Or we might posit that these leaders have good intentions but get outmaneuvered by neoliberal partners at the negotiating table. If either of these were true, however, then all we would need to do is replace these corrupt or ineffective leaders with another wing of the party. Admittedly, we can find examples of both these scenarios in recent history, but, on the whole, they are not sufficient explanations for these recurrent losses. The parties’ respective traditions, compositions, and orientations differ too much to reduce their failures to a problem of leadership. Instead, we must locate the cause in the balance of social forces. Capital has become so strong that it can not only withstand left-wing governments’ attempts to reform it, but even turn those governments into instruments of its own interests. The examples above show that left-wing reformism in Europe can neither produce a real break with neoliberalism nor strengthen left forces. Europe’s left parties should accept that the path to social transformation through center-left governments is currently blocked. Instead, they must develop alternative strategies and work to shift the balance of forces though patiently building strong, interconnected, and well-organized left parties, mass movements, and militant trade unions. The Left will only be able to wring substantial concessions from capital when we have pushed it on the defensive. We do this by escalating social struggles and making capitalists fear for the future. Even then, it will remain to be debated whether left-wing governments represent an adequate strategy for socialist transformation — but at least it would give left parties the chance to do more in government than repeat the same old defeats. Florian Wilde is a member of the National Executive Committee of Die Linke, the German Left Party.